Better Skin Mirakle Cream Review (2018): Does It Work? The Better Skin Company Mirakle Cream Review: Ingredients, Side Effects, Detailed Review And More. What is Better Skin Company Mirakle Cream? As per the manufacturer, The Better Skin Company Mirakle Cream is an award-winning Moisturizer , naturally-based cream that is suitable for men and women to use as a way to keep their skin healthy and young looking. However, no substantial evidence is available to prove it is effective. Better Skin Company Mirakle Cream– Does It Really Work? What Are The Ingredients In Better Skin Company Mirakle Cream? How To Apply Better Skin Company Mirakle Cream? Does Better Skin Company Mirakle Cream Have Any Side Effects? It is marketed and sold directly from The Better Skin Company’s website but is also available at select retail stores and costs $34.00 for 2 fl oz. While the company website is well-produced and user-friendly, customers are required to email any inquiries they have in regard to the company’s refund and return policy and the full contact details for the company are not provided. 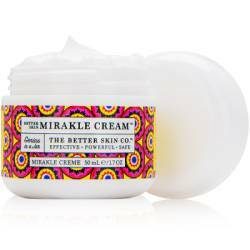 The Better Skin Company is a manufacturer of just three products including the Mirakle Cream. Although they are small, they appear to be reputable and their products are sold in some higher end retail stores. Their official website contains some background information about the founders of the company, shows where the products can be purchased from and includes information about their affiliate program. All of The Better Skin Company’s products are made without the use of parabens, they are gluten free and vegan. Better Skin Company Mirakle Cream – Does it really work? The Mirakle Cream is described on the product page as ‘genius in a jar’, providing intense, rich ingredients that balance and brighten the skin. It can be used by people of all ages who simply want to improve the look of their skin but, being rich in antiaging ingredients, is particularly suitable for those who want to address signs of aging such as lines, wrinkles, age spots (also known as hyperpigmentation) and a reduction in collagen. It provides antioxidants to fight free radical damage. It helps to eliminate dry and scaly skin. Moisture is retained in the skin more efficiently. Areas of hyper-pigmentation are reduced. Reduces sagging skin so it’s firmer and tighter. Hyaluronic Acid: Attracts moisture from the air and locks it in the skin. However it may cause allergic reactions. Coconut Oil: Moisturizes and softens the skin. Peptides: Provide nutrients for aging skin cells, helping them become healthier and able to withstand skin stressors. Algae: Has a soothing effect on irritated skin. The formula is free of parabens and safe for sensitive skin. However, according to customer reviews, it isn’t very effective. It contains potent antioxidants for long term protection. Ingredients have been clinically tested. Not all ingredients are explained in detail. There are no free samples. Refund details are not provided. Judging from the ingredients used in The Better Skin Company Mirakle Cream formula, consumers should not experience any harmful or negative side effects when using this product. According to the website, this cream can be applied liberally to the entire face. It is not stated how often it should be applied but daily application is likely required. There are some positive points in regard to The Better Skin Company Mirakle Cream including the fact that it has received good consumer reviews, is relatively affordable and contains some excellent antiaging ingredients. It would, however, be helpful to know more about the key ingredients used in the formula in terms of how they work and their amounts, and consumers should also be given full details of the company’s refund terms, particularly if they are purchasing it online as return policy is not mentioned in official website.